You will need to pack up your RV/Trailer to make sure that it is road ready and everything is secure. Make yourself a checklist. The first couple of trips may take longer to get ready, but the more you do it, the easier it will become. Plan how much you will be driving each day and how much time you plan to spend at each spot. One of the best parts of the RV life is that you will be able to experience and see parts of the country that you’ve never seen before or just passed through. Now you can stop and smell the roses so to speak. I spoke with one fellow RVer who said that he makes it a rule never to drive past 3 in the afternoon. No night driving and he is where he needs to be by 3 and setup and ready for dinner at 5. One of the best parts about being part of the RV community is that everyone has been in your shoes and is eager and willing to help. They will know what works and what doesn’t. So ask away! 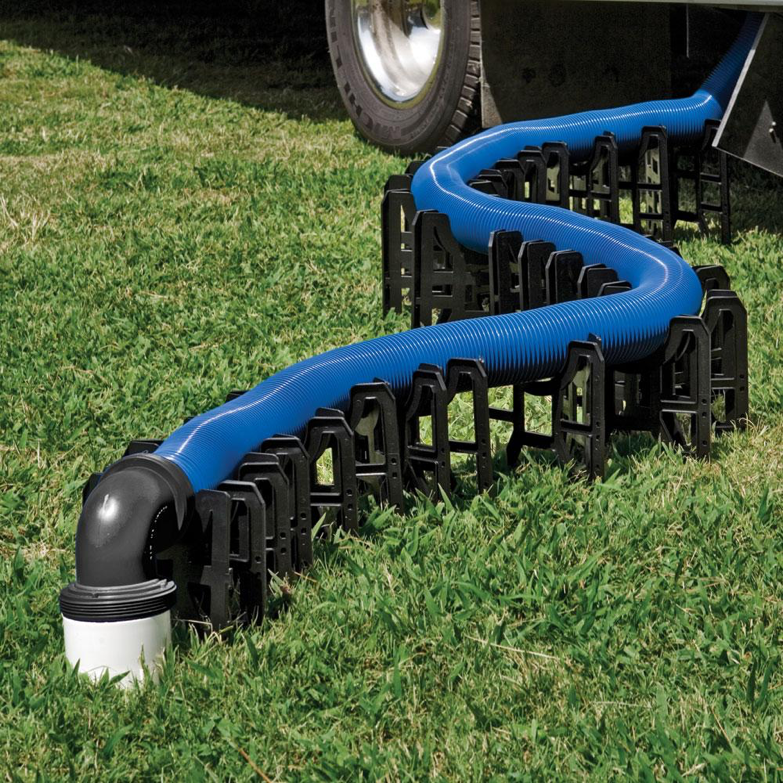 You probably have a sewer connect hose, but you will also need a flexible sewer support for your hose. Most RV parks will have sewer for you waste, but if you don’t have the sewer support for your hose, you will need to lift the hose yourself to drain it. Another useful tip about the sewer waste, remember to open the black lever first, then the silver. Close the black lever before driving off, it is against the law to drive with your sewer line open. Unless something horrible happens, it’s a painless process to dump your black tank (where your pee and poop is stored). You never make contact with it and a chemical turns everything into an unidentifiable green liquid. You can pack a pair of old work gloves if this makes you more comfortable. You can also pack an old garden hose to rinse out your sewer hose after you’ve drained the sewer. A lot can happen on the road, so be flexible with your plans. Sometimes your RV might even need repairs while you’re on the road. If you do have issues or problems, Google, “Mobile RV Repairs” for whatever area you are at and there may be someone who will come to you to make the repairs. On the flip side, you may find a place you really love and you’ll want to spend even more time there. Whether you’re traveling with your significant other or with your entire family, it’s important to find alone time. Whether that means getting out on a trail, spending time outside, or putting headphones on, it’s a must to keep everyone sane. WiFi is tricky on the road. The resources that are “free” to most people like, WiFi at RV parks and public spots can be very slow due to the amount of people using them. We got a Verizon JetPack, which made a huge difference on speed and reliability. A lot of campsites have cable, but you will need a coax cable to hook the outside cable box to your RV. Contact Willard’s Garage for all of your RV Repair Billings MT needs!